It seems I have just acquired this little number. Here is a photo of the 1st owner saying a fond farewell. Last edited by Zunspec on Sat Aug 08, 2015 11:07 pm, edited 1 time in total. 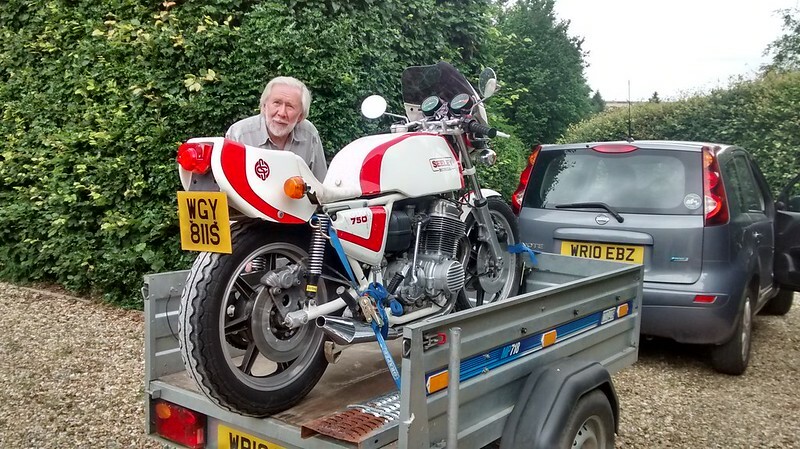 It looks really great Zun - the CB750 had a decent engine but was hampered by its frame. 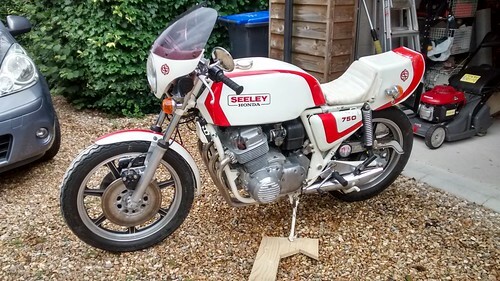 I have got it MOT'd and taxed and have ridden it for about 10 miles. No. 3 cylinder is not working full time, verified by the plug reading (sort of wet looking). Oddly the other three plugs look well lean. I still have to strip/clean the carbs so will see how that improves things. The ride itself feels great, sort of suits my era/style, can't wait for new tyres and getting the engine running properly. I'll look forward to hearing more about this. 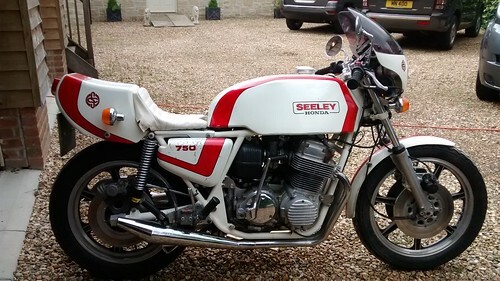 The Seeley Honda 750 is a lovely machine right enough . 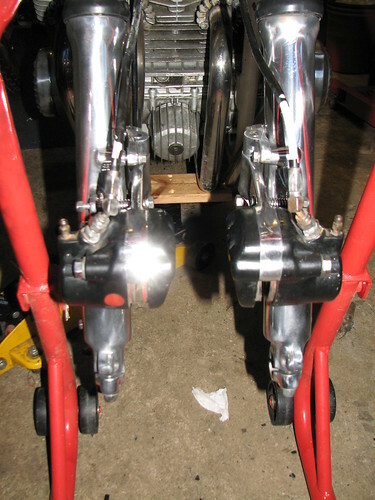 The carb strip and clean has certainly improved the engine and it is now revving to the 8000 redline. Still not there however, I still think there is a slight miss-fire going on. I've only done about 20 miles on it so further running might bring it back to full potential. One inevitable result of moving things around, the 37 year old black plastic covering on the brake hoses is splintering like a splintery thing. New hoses added to the list lol. Progress is being made ;D. The Pagehiln rear master cylinder seems to be functioning correctly after a thorough clean up. The bike has passed it's UK MOT inspection, is taxed and insured so I can do some road testing. After removing the front callipers to extract the front wheel for it's new tyre (Avon AM26 Roadrider 100/90-19) I then cleaned everything up. Upon getting the wheel back in I then had severe binding on the left disc. To cut a long story of strip and re-assembly (many times) short I finally found good info on the US SOHC Honda site site on how to do it properly. Shimmed the floating calliper arm to be parallel to the disc and all is now good. So this morning I was looking forward to getting a decent ride, Nope . The new rear tube had punctured so back to the bike shop to get a new one installed. Funny one, the puncture was on the inside of the tube, the side that is closest to the rim. No obvious snag on the rim so with wheel now holding air I got the chance for a little ride. Wow, what fun, I really like how this machine feels. Still have a slight miss-fire I think, there is a sort of "harmonic" tone to the exhaust note and it does not seem to rev as freely as I think it should. Still, getting there, now to investigate that engine a bit more closely.